COR provides kosher certification to companies in New Brunswick, a province with a rich agriculture and agri-food sector. The industry is flourishing with over 3,000 farms and 100 food processing plants. This sector is responsible for over $400 million in farm cash receipts and $1.2 billion in processed food and beverage shipments. COR can help to provide differentiation to your product in this increasingly competitive industry. COR employs a team of talented rabbinic inspectors who are experts in the intricacies of modern food production as well as the specifics of Jewish law. COR employs local representatives located in New Brunswick who work in conjunction with food manufacturers to inspect and certify each product under COR supervision. The COR symbol is trusted by consumers in New Brunswick and around the world and notifies them that a product is in full compliance with the highest kosher standards. To consumers, the COR stands for quality. In the increasingly competitive food products market, companies located in New Brunswick and around the world must distinguish themselves from their competitors and seek out any advantage available. 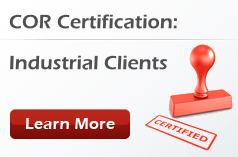 This is where COR can help your company.